The products present as standard NFC Forum Type 4 tags, so are compatible with both Android and iOS devices. They can be read without an app using Apple’s newest iPhones. You’ll learn about the chip’s encryption capabilities, its Secure Unique NFC (SUN) function that generates a unique signed URL for each tap — useful for authentication — and its new privacy features built to aid compliance with the latest regulations. You’ll also learn about the TagTamper version of the tag and its tamper loop, used to detect if a product has been mishandled or opened before the sale. A quick read of the tag’s status verifies that the loop is intact and confirms product integrity. This brochure should be read by those looking to implement product authentication at the point of sale or in the supply chain, including brands, manufacturers of luxury and premium products, those that experience difficulties with counterfeit and imitation products, and marketers looking to create next-generation user experiences and brand interactions. It is also relevant to those implementing supply chain traceability, or that need to detect product tampering, as well as executives concerned with ensuring authenticity of coupons and gift vouchers. This document has been produced and sponsored by NXP and approved by the NFC World editorial team. 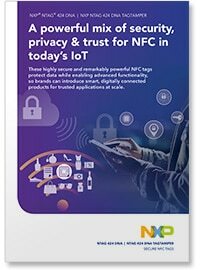 This six-page brochure is available free of charge to NFC World Knowledge Centre members (PDF format, 2.1MB).